Mr Rana Talwar is the Founding Chairman and Managing Partner of Sabre Capital. He has over 35 years of management and operational experience in the banking and Financial Industry and holds a Bachelor’s Degree in Economics from St. Stephens College, Delhi. 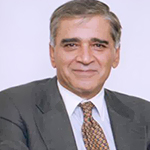 Mr Talwar was formerly Group Chief Executive of SCB Plc from 1997 to 2002 and was responsible for transitioning SCB to one of the leading emerging markets banks that it is today. Prior to that, Mr Talwar was an Executive Vice President and Policy Committee member at Citicorp and Citibank. Mr Talwar was instrumental in Standard Chartered Bank’s major acquisitions, including the Trade Finance business of UBS, Grindlays Bank in India, ANZ Middle East Assets and the Credit Card business from Chase Manhattan in Hong Kong.